Over 48 Years of Service from "Bay Area's Best"! 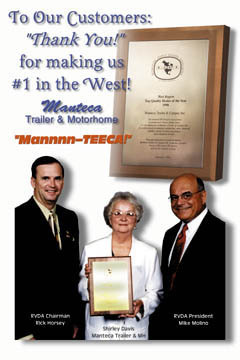 Since 1970, Manteca Trailer and Motorhome, LLC has looked out for their customers through a commitment to warm, personal attention and high standards of product and service excellence. Manteca Trailer and Motorhome, LLC has always specialized in bringing the RVer the best value in their purchase. Whether it be the refund the difference if you beat our price policy, all the inventory bought from the dealerships that just don't make it, or the the inventory that comes through the relationships held with banks that trust Manteca to look after their business. Besides winning numerous awards from manufacturers’ and multiple "Best of Awards", the dealership was the recipient of the prestigious industry award, "West Coast Dealer of the Year". Having years that include sales numbering over 1200 units, Manteca Trailer and Motorhome, LLC, has become one of Northern California's highest volume California RV Dealer by offering the best buys and service. 2010 was our 40th anniversary and we are still going strong. The second generation ownership is now looking to the third generation to participate. Our motto has become "Stronger than Ever" and you can bet we just keep getting stronger. In 2017 Manteca Trailer and Motorhome was recognized by RV Business as a Top 50 Dealer in the U.S. Also in 2017, we received the Gaylord Maxwell Innovation Award for Oustanding Business Creativity and Ingenuity. Look to Manteca Trailer and Motorhome, LLC. to have the buying power to help you make the purchase that you brag about for many years to come. Go to our closeouts page to see examples of some of the great buys. The staff at Manteca Trailer and Motorhome will tell you, "We represent Only the BEST!" We have a great selection of Used Travel Trailers For Sale along with Used Fifth Wheel For Sale. We are also a California Jayco RV Dealer offer the Jayco Jay Flight Trailer.